Honor Your Mother 10-Pack Give-a-way! 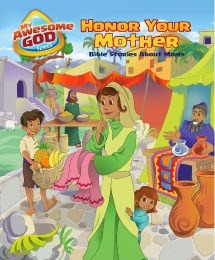 Raising Godly Children Ministry is teaming up with DiscipleLand Ministry to give-a-way this “Honor Your Mother” Children’s Bible Study to 5 Winners on Saturday, April 19th! You can read information about the product below and enter the raffle below. Honoring parents is a cornerstone of family virtue—and a command from God! This delightfully illustrated storybook will give your kids a biblical basis for honoring and respecting their mothers! Seven Bible stories of mothers who model faithfulness will prompt your children to hold their moms and mother figures in greater esteem. These booklets are perfect for Mother’s Day or any time you teach kids about honoring their parents. BONUS: Download a free idea sheet to go along with this booklet here. To enter the give-a-way complete one or more of the options below. The 5 winners will be picked on April 19th. The winners will be contacted via email and has 72 hours to respond with their address. The more options you complete the better chances you have of winning.